Aero Mist high pressure misting systems provide an effective solution for dust suppression by implementing products designed to attract and neutralize dust particles resulting from: mining and quarry industries, land and construction development, lumber and grain processing facilities, conveyor belt drop points, fiberglass production, cutting, grinding and sanding facilities and waste transfer plants. Airborne dust particles decrease workplace health conditions for employees and have an adverse effect on machinery and equipment. Dust issues significantly decrease efficiency in production. In 1987, EPA replaced the earlier Total Suspended Particulate (TSP) air quality standard with a PM-10 standard. The new standard focuses on smaller particles that are likely responsible for adverse health effects because of their ability to reach the lower regions of the respiratory tract. 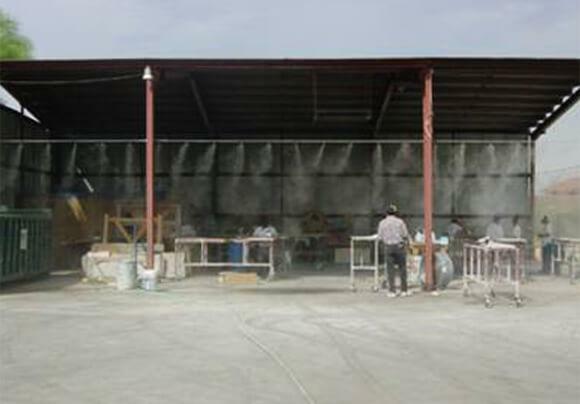 Aero Mist dust control systems are custom-designed and engineered to exceed the EPA PM 10 standards for dust suppression. High pressure mist systems produce 10 micron water droplets that attract, suppress and remove fugitive dust particles through the process of agglomeration. The dust particles will drop harmlessly from the air without wetting the area. Our high pressure stainless steel mist system with custom spacing and nozzle size effectively suppress dust particles to meet the needs of any application, assuring continuous compliance with existing health regulations.